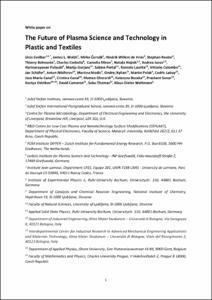 1) To study textile biotechnology, including the applications of enzymes and biopolymers to fibres, yarns and fabrics in preparation, detergency, bleaching, dyeing and finishing processes. 2) To study innovation in spinning processes, including compact core spinning; drawing systems; the spinning of sub-standard raw materials; and physical textile parametrics. 3) To develop clean technologies for their application in preparation, detergency, bleaching, dyeing and finishing processes. 4) To study the physical chemistry of surfactant products and textile detergency, including the formation of double electric layers (electrokinetic phenomena); the application of surfactants to textile finishing processes; and the characterisation of surfactants and their application to interfacial phenomena. Claramunt, J.; Ventura, H.; Toledo Filho, R.; Ardanuy, M.
Carrillo, F.; Duran, A.; Cayuela, D.
Tornero, J.; Cano, F.; Domenech, M.C. Carrillo, F.; Prieto, R.; Cayuela, D.
Ventura, H.; Claramunt, J.; Gonzalez, L.; Pares, F.; Ardanuy, M.
Carrillo, F.; Prieto, R.; Cayuela, D.; Gutierrez-Bouzán, C.
Carrillo, F.; Duran, A.; Cayuela, D.; Vilaseca, M.
Carrillo, F.; Cayuela, D.; Prieto, R.
Carrillo, F.; Duran, A.; Cayuela, D.; Gutierrez-Bouzán, C.; Tornero, J.
Carrillo, F.; Prieto, R.; Cayuela, D.; Gutierrez-Bouzán, C.; Tornero, J.
Oliver-Ortega, H.; Llop, M.; Espinach, F.X; Tarrés, Q.; Ardanuy, M.; Mutjé, P.